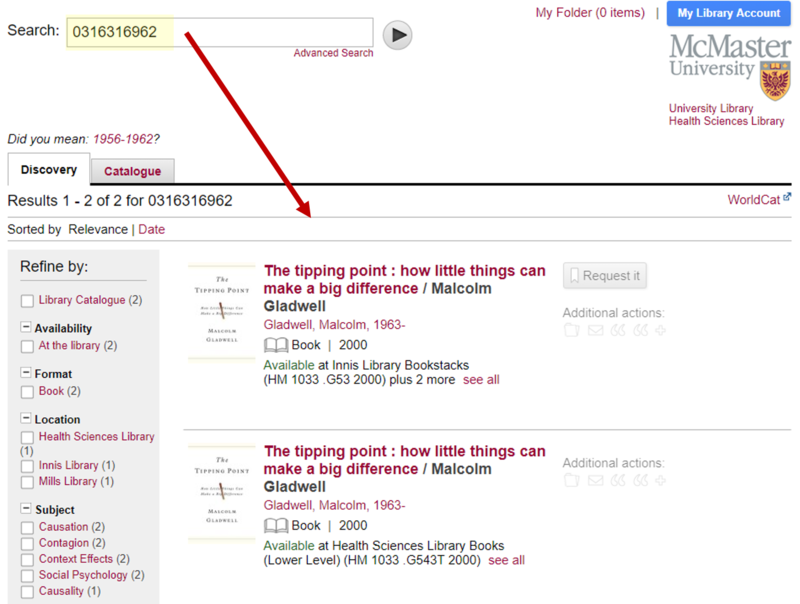 A guide to McMaster's Discovery & Library Catalogue search. To search for keyword(s) anywhere, enter your search term(s) in the Basic Search (default) or Advanced Search (default Keyword index). NOTE: Numbers can also be used in a keyword search. Consult the Search Tips section for guidance on how to construct your keyword searches using Boolean operators, wildcards and quotation marks. When the search is submitted, the results can include both physical and online items containing your keyword(s). The results can include a large amount of resources, many of which may be irrelevant to your search. The Refine by: column on the left allows you to limit your results using a variety of criteria including Format, Location, Subject, Language, Geography and more. To search for keywords in the author, title and subject fields, go to the Advanced Search and select the desired index from the drop-down menus. Use the Boolean operators AND, OR and NOT to combine search words. NOTE: AND is the default Boolean operator. NOTE: Browsing alphabetical lists of authors, titles and subjects is not supported in Discovery or Catalogue. 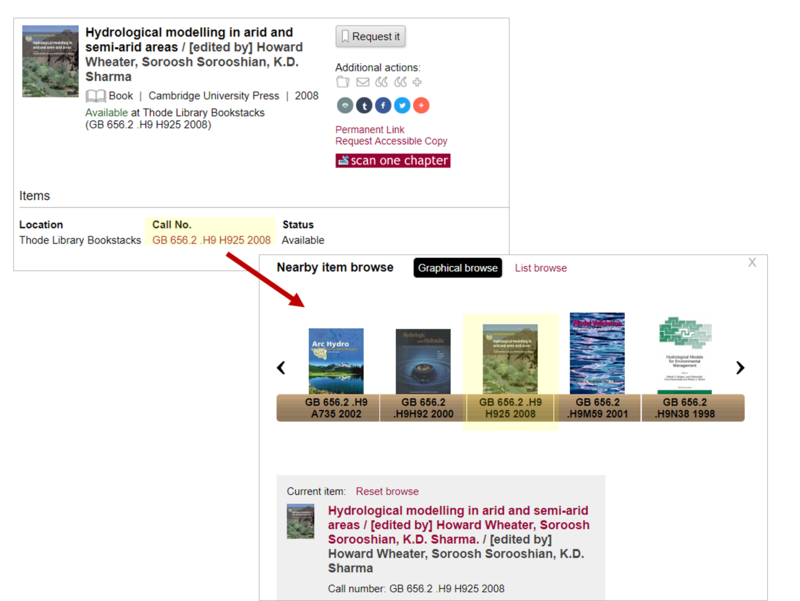 To browse Catalogue content by author, title or subject, use the Classic Catalogue. There is no browsing option for "Articles & More" content in Discovery. A DOI (Digital Object Identifier) is an alphanumeric string assigned by a publisher when an item (usually a journal article) is made available online. Thousands of DOIs are indexed in Discovery and more are being added daily. NOTE: DOI searches are only supported in Discovery. NOTE: If a DOI search returns no results, try searching for the title of the item. Common identifiers such as ISBN (International Standard Book Number) and ISSN (International Standard Serial Number) can also be typed into the search box of Discovery or Catalogue. ISSNs can also be searched with or without dashes, but may be inconsistent. NOTE: If an ISBN or ISSN search returns no results, try searching for the title of the item. If you have a complete call number, enter it in the search box. If you only know the beginning of the call number, try entering it in the search box. Using the "Library Catalogue" or "Location" limits in the Refine by: column may also enhance the precision of your results. NOTE: If a call number search returns no results, try adjusting the spaces within the call number or try searching for the title of the item. If an item with a call number is retrieved, click the hyperlinked Call No. in the brief record [select see all] or full record to browse nearby items with images (Graphical browse - default) or in a list (select List browse). NOTE: You can also browse by call number in the Classic Catalogue. Select the appropriate call number index from the drop-down menu, type in a call number and select Submit to view a list of nearby items.